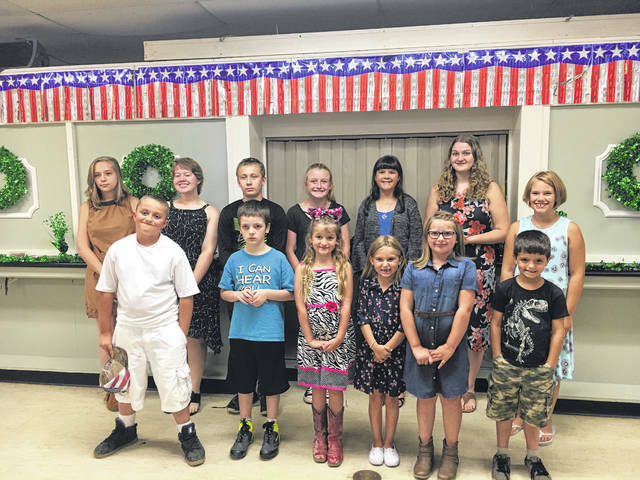 POMEROY — County 4-H’ers finished judging week Friday night at the Food and Fashion Show at the Meigs County Senior Center. The final event of 4-H judging week was Friday night to recognize the members who completed food and fashion projects. The judging for those projects was earlier in the afternoon but participants showcased their projects and creations to members of the community. Among the reviews for the food and fashion projects were Cloverbud show and tells. Cloverbuds, ages five through eight, talked about projects they worked on with their club advisers. These projects included caring for animals and livestock, fishing, growing vegetables, sewing purses, painting, and various arts and crafts. Kyra Zuspan also gave a demonstration and is eligible to compete at the Ohio State Fair. Her demonstration was about the importance of wearing your crown and complimenting others to make a change in the world. Zuspan also noted that 4-H’ers are more likely to make these changes and to give back to their communities. Caitlin Carr was named as the Meigs Country nominee for the Lloyd and Doris Roby 4-H Clothing Program Award. The final selection will be based on overall outstanding achievement in 4-H clothing projects, as well as leadership skills in the 4-H program. The winner will be awarded $500 toward college tuition. Carr and Zuspan were nominated for the Master Clothing Educators of Ohio Award in the senior and junior categories, respectively. The final selection for both categories will also be based on overall outstanding achievement in 4-H clothing projects and leadership skills. The winners in each category will be given a cash award to be applied toward college tuition. Carr was nominated for the State 4-H Fashion Board. Selection for the board will be made during the 2018 Ohio State Fair Fashion Revue.